I am very happy to announce that my new course “The Road To Rhythmic Mastery” created in conjunction with MELODICS has been released today. 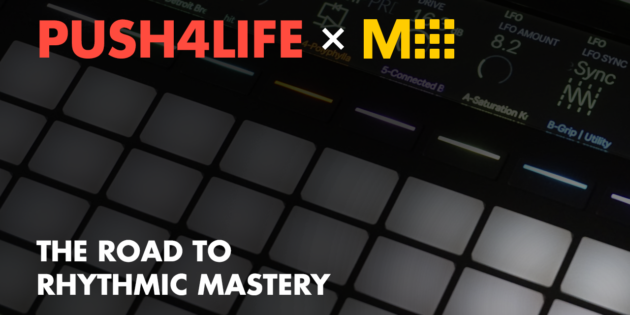 This course was conceived specifically for people who want to go from playing beats with one finger at a time to playing more complex patterns where you use both hands independently. The exercises were inspired by one of the great drumming educators – Gary Chaffee – but with my own twist to them. Most modern music is based on what is know as the 16th note grid and when you make modern day beats most of the time you are working within this grid. Believe it or not though, there are only 15 patterns you need to master in order to play anything within this 16th note grid. These 15 patterns form what I like to think of as a rhythmic alphabet and I take you through each of these patterns one by one in lessons 1 through 15. To really benefit from this course, you need to work through all of the lessons – specifically lessons 1 through 15. Ultimately you want to be able to get at least 3 stars on all lessons (100% would be even better). The best way to do this is to slow the exercise down in PRACTICE MODE until you can play it as precisely as possible. Precision is key and that is really where Melodics excels at helping you in my opinion. Once you can play a given exercise precisely at a slow speed, then you can start upping the speed 5 bpm at a time using auto bpm until you hit the target speed of the exercise. Every 16th note pattern is equally important to master. Just like when you learn to count to 10, each number is equally important to understand and if you miss one out there will be a significant hole in your understanding. It is the same with each of these 16th note patterns. You will only ever be as strong as your weakest link and if you want to be really great, you will need to master all 15. The most important exercise of the whole course though is exercise 16 where you have to play each exercise for a bar consecutively. Once you have mastered this exercise you can rest assured that you have a very solid foundation to work with.